A friend of mine created a blog today “because it’s so ´in´ atm”. True, more and more blogs are appearing on the world wide web every minute (or so). Why? Why do I blog? 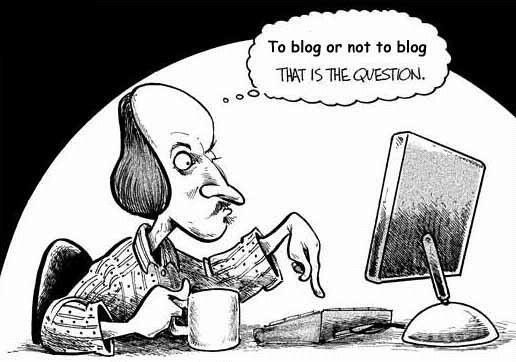 Why do people blog? I started blogging a couple of months ago. A guy of a uni society that I´m quite active in “advertised blogging” on their website and so I thought, why not, and started blogging on the society’s blog. In a Spanish lecture, some friends and I decided to create a blog to write about literature. I then created another blog to ramble about other stuff. I ended up being the only one blogging on the “literature blog” so I merged the two blogs = this blog. Like a diary, blogging has a therapeutic effect, unlike a diary, people can reach other people (those who come across their blog and can be bothered to read it 😉 ). You can talk about anything that interests or that occupies you. It´s good procrastination/a good time-filler, no matter how ´bad´ it might turn out, as long as you enjoy doing it! This entry was posted on 13/07/2011 by G in Miscellaneous and tagged blogging, procrastination.